Earlier this month Tourism Ireland joined forces with HBO’s hit TV show Game of Thrones to market Northern Ireland’s rugged landscapes, crumbling castles and magical mountains as the real life Westeros to the rest of the World. HBO is lending its name and logo to the new campaign, which was rolled out by Tourism Ireland through ads on Facebook and Twitter in the UK, the US, Canada, France, Germany, Spain, Italy, Holland and Scandinavia. Tourism Ireland has also created a dedicated land page on their website showing off the locations where the popular medieval fantasy series was set. The huge marketing effort can also be seen offline in the Game of Thrones signage that is being placed at key locations from the show around Northern Ireland. This is a marketing tactic that worked well for New Zealand in the wake of the Lord of the Rings movie series. Planted by the Stuart family in the eighteenth century, the trees were originally intended as a landscape feature to wow visitors as they approached the entrance to the family home, Gracehill House. Two centuries later, the trees have become a must see destination in Northern Ireland for Game of Thrones Fans. These trees are currently protected by a Tree Preservation Order issued by the Northern Ireland Planning Service. 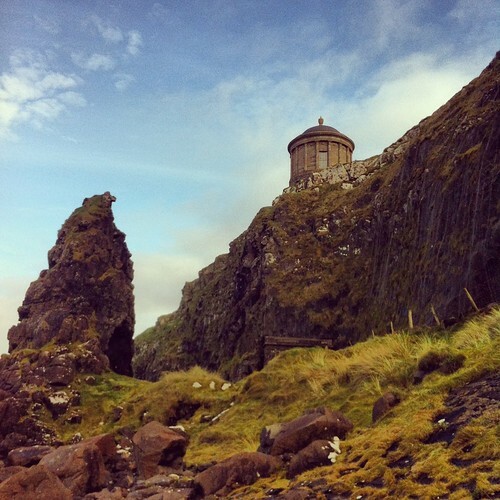 Already one of Northern Ireland’s most visited beaches Downhill Beach is overlooked by the easily recognised Mussenden Temple. Fans of the Game of Thrones series will easily recognise the view as a doppelganger for Dragonstone Castle. 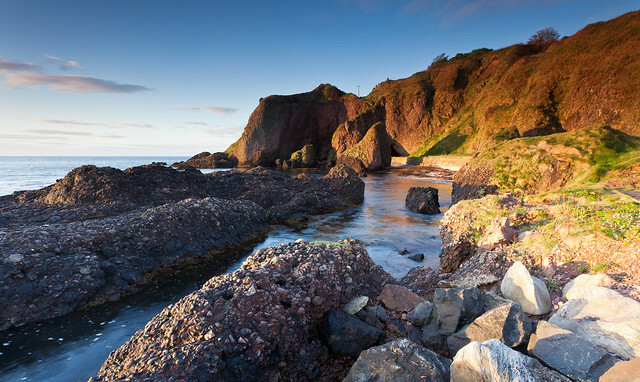 The Caves at Cushendun are a natural attraction formed by over 400 million years of extreme Irish weather conditions. Fans of the show will be happy to know they can be accessed on foot from near the coastal village of Cushendun in Co. Antrim. 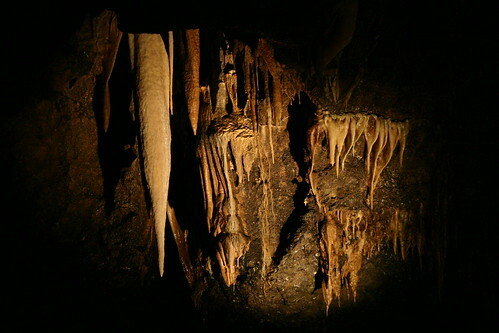 One of Europe’s finest show caves, The Marble Arch Caves are located at Florencecourt, County Fermanagh. They give visitors the opportunity to explore the natural underworld of rivers, waterfalls and winding passages. Game of Thrones fans will notice that the caves were used to film scenes such as the hideout for the Brotherhood Without Banners. 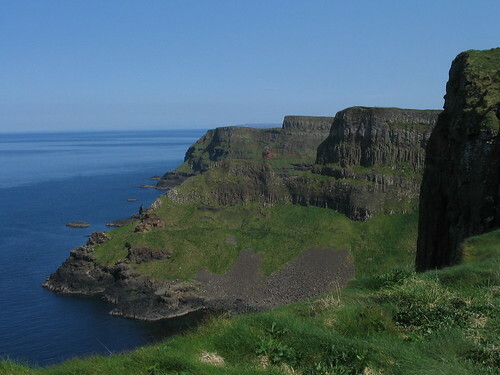 The Causeway Coast has multiple locations featured in the hit show. GOT Fans wanting to visit the Iron Islands will have to look no further than the view from the Ballycastle approach to The Causeway Coast. Ballintoy Harbour is also a dead ringer for Lordsport, the port town on the island of Pyke, which is the seat of House Botley. Budget Car Rental Ireland created a map showcasing the locations of the popular series as a self-drive option. The full version of the map is available here for anyone wanting to spend time exploring Co. Antrim, Derry and Down. The Stones & Thrones tour company offer a unique day tour of discovery, giving the opportunity to explore the scenic splendour of the seven kingdoms and see where so many of the pivotal Game Of Thrones scenes were shot! The tour will last 1.5 hours and will set you back £35.00 per adult. The courtyard of Clearsky Adventure Centre at Castle Ward Demesne Northern Ireland is one of the actual filming locations of the show. They have masterfully recreated a replica of the ‘Winterfell Archery Range’ in the courtyard in the very same spot that the filming took place, and offer an authentic archery lesson in complete costume from £25. Game of Throne day tours are also available from Dublin starting April 21st departing from CHQ Building, Custom House Quay check out Game of Thrones Tours for more details. It’s one of the most annoying things in the world is that when you update your Linkedin profile your connections start congratulating you. Ok, so if you have changed jobs, that’s cool because maybe you want to be congratulated. But if you have just edited your profile OR perhaps your current role has a new title, your entire network is notified. Super annoying! Not only that, but perhaps you are “job hunting” and you are spring-cleaning your profile, your network will see your notifications and also what companies you have recently followed. So, let’s put a stop to all of this. Phlok – Connecting Local People with Local Business. Phlok is all about connecting local people with local business. It’s a unique Irish social media platform that rewards you for shopping local, it’s also a free app available in the app store and Google Play. Every merchant and business that you see on Phlok, gives you the availability to collect Phlok points. These points are a virtual currency and worth real money (1,000 points = €1). Just from signing up, you receive 2,000 points! Phlok points are unique, in that you can collect and spend them in any participating Phlok store by simply clicking on your points total at the top of the screen and follow the simple instructions. You can collect Phlok points by checking into locations, following Phlok businesses and making purchases in Phlok stores. It is quite addictive building up your Phlok points and you can also collect points by inviting your friends to join! With the app, you can check out where your friends have checked in and see how you compare with their phlok points, it has most certainly has brought out that competitive streak in me! Phlok is very much a social media platform with a focus on shopping local. When you sign up with Phlok you set up your profile and it gives you the option of signing in through email or facebook. Once logged in, the app uses your GPS to locate business using Phlok close to you. Your mobile will even automatically alert you when you are near an offer! It also has a map option, so that you can search locations and business to see what other offers are in place. You can see a live feed of people who have checked-in and received points in doing so. There is also the option to send group or private messages to people in your ‘Phlok’. Each business also has a profile, with information such as address, phone number, website and what their latest offer is etc. and they can also update their status with relevant information to their customers that will appear in your news-feed/activity page. Phlok has numerous different local businesses signed up to bring you a wide variety of different categories that will benefit all users of Phlok. There are local businesses from bars to motoring to butchers to clothes shops all signed up, wanting to pass on the reward for encouraging you to shop local. Phlok can only grow stronger and in the coming months you will see it rolling out into more counties across Ireland and abroad. Recently is has landed in the UK and only last week gained press coverage in Ilkley. Another great app to come from the Emerald Isle, definite one to download and watch this Phlok grow! Check out Phlok’s blog here. It was only a matter of time before Publin released their app after the success that they have received with their facebook and Twitter following. Publin is the new free app to find pubs and drinks promotions that are on in and around the city. The app gives you the option of searching for a particular pub or you can use the GPS on your phone to locate pubs close to you and give you information on those pubs such as drink prices, offers, wifi, opening hours, disabled toilets, craft beer etc. You can also search pubs by amenities, for example beer gardens, handy for those (rare) sunny Sunday sessions! All this information in one handy app. The app is also linked with their facebook and twitter feeds, so that you can keep up to date with the daily deals that are currently going on in the city. Publin seem to have a good relationship with the different pubs around the city, who will contact Publin about their offers. The creators have plans to further develop the app to include deals from pubs, event listing and other entertainment. It’s a well know fact that Google Play and the App Store are overrun with different photo apps to choose from. Which, if you are/were like me in the beginning of my smartphone days, found the app store a little daunting with all the choice of different apps/tools to edit your pictures. So when I came across this little gem I had to share! ‘PhotoGrid – the best collage maker’ is an absolute beaut of a collage app! Not only is it the only go-to app to combine your photos into paneled, framed collages, is has a very easy to use interface, which ensures that when you are creating your collage you get to have fun in doing so and not get bogged down with the technicalities! First, you choose which mode you want to use for your collage, they have several options here available: Grid HD, Free HD, High, Wide and Single HD. Secondly, you select the pictures (max 9) you want from the gallery on your phone or the cloud -facebook, Instagram, Flikr, Dropbox or google image. PhotoGrid lets you choose a layout or it will select one and if you are not happy with it all you have to do is shake your phone to rearrange the layout! What I really love about the app is that you can hone in on each of the images and move them around to fit as you wish, and rotate and flip each picture, add filters, borders, frames and text. You can be as creative as you like! Once you are happy with your collage, you can download it, save it and share it on all social platforms!